The Gathering Storm - Jimmie Aaron Kepler, Ed.D. 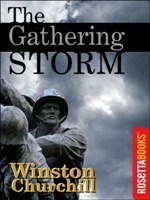 The Gathering Storm by Sir Winston Churchill is the first volume of Churchill’s Noble Prize winning six-part chronicle of World War II. This six-book series is Churchill’s personal memoirs. The Gathering Storm depicts the rise of Hitler and the indifference of the leaders of the European democracies to the clouds of the gathering storm. Churchill incorporates contemporary documentation and his reminiscence in this opening memoir. Churchill’s mastery of English is reason enough to read this book. The book tells the story of the events between World War One and World War Two. Churchill shows how key events were ignored or the people simply hoped they would go away without dealing with them. The resulting inaction allowed many of the later events to occur, thus escalating the size and difficulty of the task. Sir Winston Churchill won the Nobel Prize in Literature in 1953 for this book and the other five books in the series.